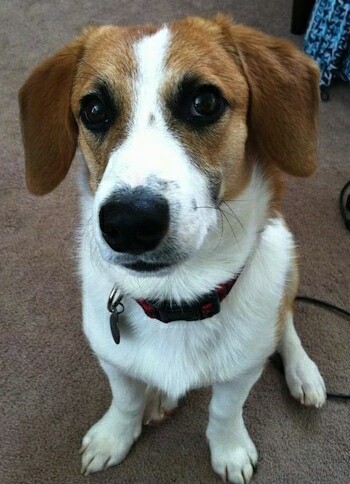 Rocky Road the Beagle / Corgi mix at 2 years old—"Rocky loves to chase his food bowl around the yard with his nose!" The Beagi is not a purebred dog. 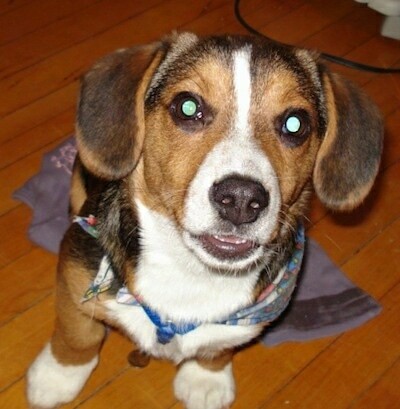 It is a cross between the Beagle and the Pembroke or Cardigan Welsh Corgi. The best way to determine the temperament of a mixed breed is to look up all breeds in the cross and know you can get any combination of any of the characteristics found in either breed. Not all of these designer hybrid dogs being bred are 50% purebred to 50% purebred. It is very common for breeders to breed multi-generation crosses. 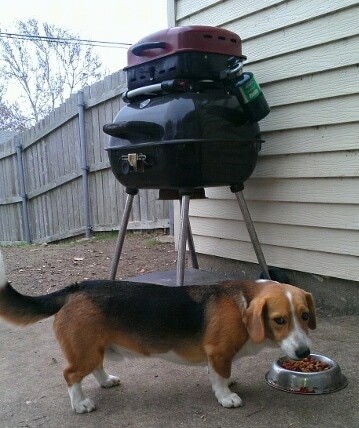 "This is my little Bailey! I took these photos with my camera when he was about four months old. He loved the camera right from the start. Bailey is just a big ham! 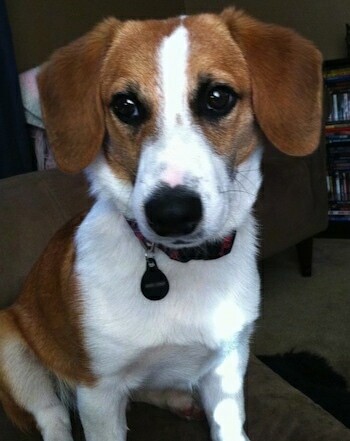 He's an eight-month-old Corgi / Beagle Hound mixed breed. I found this site and started to learn more about his heritage and it was amazing to see how great of a mix these two breeds are, even though I see it every day in him! He is very friendly and just loves attention. Bailey is great with Frisbees even though he is so short in stature which I guess comes from his Corgi part. He's great with kids and is very gentle around them even if they are not. Bailey loves to be around other dogs and plays well with the Boxer that lives next door. They could play for hours at a time. Bailey hates taking baths and puts up a real good fight. I have no idea where his strength comes from sometimes! He is deathly afraid of hair dryers and vacuums. Bailey loves to ride in the car and puts his head out the window even when it’s raining! This dog cannot get enough of the outdoors. He chases anything that flies! Bailey was a little tough to bathroom train but we have finally gotten there. I bring him over to my mother's house to swim in the pool. He really is a great swimmer and loves being in the water except for when it is bath time. I never got to see his parents or siblings since I got him from a farm in Pennsylvania. 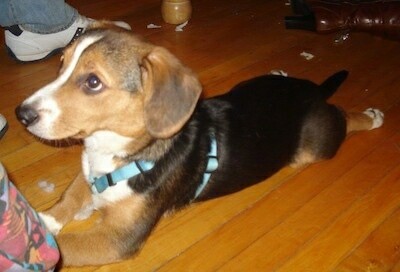 I know that his mother was the Beagle hound and his father was Corgi. Bailey has the cutest little bark when he's playing but comes up with this strong masculine growl when there is someone outside he doesn't know. He is my best friend and a great companion and I am surprised to see that his mixed breed hasn't become more popular. Maybe it will after people read this!" 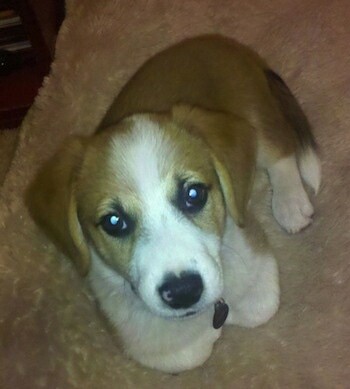 "Han Solo Lafarier is a Welsh Corgi and Beagle mix. Dad was my friend John's dog named Kirby (Corgi) and mom was another friend's dog named Daisy (Beagle). He has a fun and lively temperament, is good with kids, great with adults, and likes to hang out with other dogs. He is a terror to cats in an entertaining way. He has many quirks, most of them are funny. He is kennel trained and was very easily so...but in the morning he lets out his standard little growl/yawn/stretch. He loves to chew on ropes and wabba toys. Loves to give kisses and jump up for hugs. Likes to "box" with me. He dislikes our questionable neighbors and doesn't care for baths. Freaks out when we cut his nails and will tolerate brushing. 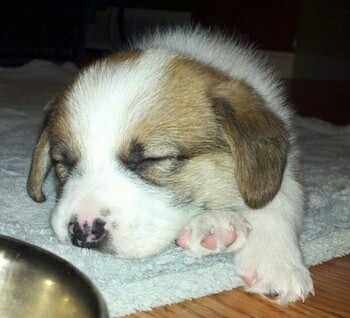 As a mix, out of a litter of five, he has more Corgi characteristics, he has a longer snout, longer body than his brothers and sisters. Great energy, he is a lover and a lap dog of sorts. Except for floppy ears he is a slightly taller Corgi; Beagle wise he has the howl/bark, sometimes he will dig into the yard, and he likes to chew on stuff, though he has been very good about the barking and chewing. Training wise he knows my fingers snapping, and the command word I chose was "Aehh." This is just to get his attention; other commands come after and he is usually very good in response. Sometimes and mostly because of the teenager syndrome he will act rebellious. We simply snap and he will stop. He keeps going…we say no…he keeps going—a pat on the bum certainly stops him dead in his tracks. For all of his good behavior we started giving him training treats, so pooping outside, obeying a command, and just being a good boy. We walked him off of them to the point where he accepts pets with occasional treats and belly rubs as a reward. Overall Han is a joy and has been a wonderful dog and will no doubt continue to be. So far he is fantastic."